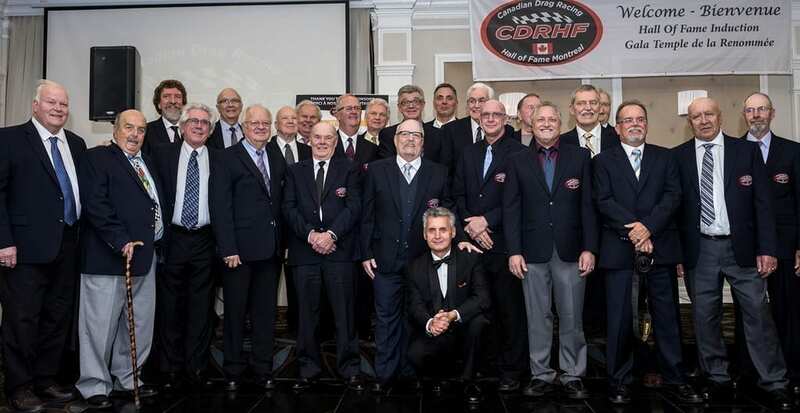 (MONTREAL, QC) October 16, 2016- Twenty-three of Canada’s drag racing legends were inducted into the Canadian Drag Racing Hall of Fame at the Second Annual Gala held at Hôtel Universel in Montreal, on Saturday, October 15, 2016. Among the inductees recognized this year was world champion Gianni Cantusci. Drag Racing is the Fastest and Quickest form of Professional motorsport racing in the world today. Professionally built and driven race cars that compete, side by side, at speeds of over 332 mph (534.30 Km/h) in a 10,000 H.P. Top Fuel dragster in less than 3.680 seconds across the finish line. The race follows a short, straight course from a standing start-over a measured distance, most commonly 1/4 mile (1,320 ft. (402 m), with a shorter 3/16 mile (1,000 ft. (305 m)) for Nitro methane powered Top Fuel dragsters and funny cars. Hello to both John Scotti and Bob Aubertin ! I just spoke today to Abe Loewen who was inducted in the 2016 group . As you may know Abe is a man of few words . He today though broke character and could not stop talking about how well the both of you treated him and his wife while he was in Montreal . He truly had a great time and especially enjoyed the tour of John’s classic car dealership. He was expecting to see maybe 30 cars and was blowen away when learning he was looking at 200 vehicles some including Hemi cars . Abe said it was fantastic to be able to sit and chat with people such as Beez in all his Native dress and listen to his stories . In Abe’s own words “he and his wife were treated like royalty and John and Bob are the most down to earth people he has ever met ! I personally would like to say thank you for inducting the 3 people total from Saskatchewan they are very deserving to say the least . Great job again please continue .